Wholesale items are made to order, allow 14 days to manufacture. 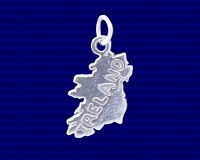 Pack of 5 Craftsman made Sterling silver Map of Ireland charms. Approx. size 10mm x 18mm.